I know many of you struggle with this every day. A small bathroom equals minimal storage space. Sometimes you can’t just knock out a wall or expand your main bathroom. So what do you do? Where do you store soaps and towels? Where do you start? There are a few things you can do to make your bathroom more efficient. First, I bet you have wall space with nothing on them. Start by adding some shelves. We have some beautiful stone shelves, glass shelves, and ceramic shelves. They are perfect for holding a variety of bathroom items, while doubling as extra counter space wherever you put them. Plumbtile offers a variety of sizes and shapes to meet your needs. If you don’t want to go with shelving, we do have some great wall units that can be placed for better function and larger storage. Whitehaus – Vertical Wall Mount Storage Cabinet With Adjustable Shelf Heights is perfect to create more space without cluttering your bathroom. 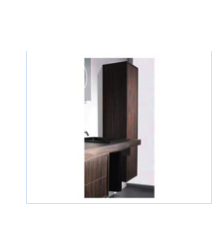 Whitehaus also has an Aeri Wall Mount Storage Unit that may be more effective in creating the space you need. Another solution would be to move your tub. If you have the room, you can create a new layout that would be more effective and efficient. Instead of putting bathtub against a wall you can place it in the middle creating even more wall space for storage. It would not only be beautiful and eye catching but would make the room larger. 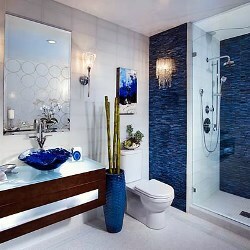 If you are unable to move the tub into the center or the room, you can create a beautiful spa shower in its place. This will make for a spa like feel and make the bathroom much larger for more shelving or cabinets. Last but not least, make use of your corners. Corners are always a waste of space. Not realizing that you can add so much more space by adding corner shelving. Plumbtile has many options for shelving and to create more space in that tight bathroom. Every inch counts and matters. Contact one of our specialists at Plumbtile today.